Nothing connects us to our heritage quite like the cozy warmth and craftsmanship of the heirloom quilts passed from one generation to the next. These quilts are more than just pretty bed-covers; these precious quilts carry within them connections to our personal, as well as cultural past. My mother had a little quilt her grandmother, Big Mama, had made for her when she was very young. 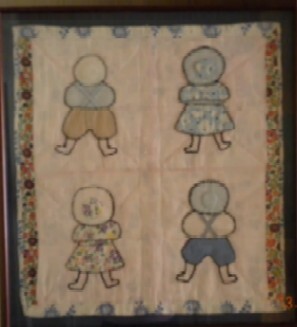 It is a traditional pattern, particularly popular during the Depression years, the Sunbonnet Children. Naturally, after years of use, the quilt became quite worn and ragged, so it was tucked away for years. Then one day my mother salvaged the least worn blocks and had them mounted and framed. They now hang in my sister's living room, a quaint reminder of a heritage rich in resourcefulness and hard work. Do you have a precious quilt? Maybe passed down from your mother or grandmother? From an aunt or cousin? Is it worn or frayed -- boxed up for safe-keeping? Or in pristine condition? Is it a carefully crafted quilt with perfect corners and exquisite stitches. Or is it a special quilt, made of colorful scraps from bits and pieces of the lives of your ancestors? Please share your quilt -- and it's story! Do you have a precious heirloom quilt? Tell us about it! Share a picture! Submitting pictures of your quilts is free and easy. Just fill in the form below, upload your picture, and hit the Submit button. When your submission is accepted, your picture and story become a "live" page on this site! You may upload as many pictures as you want -- just fill out a submission form for each one. Ready -- Set -- Go!! Who made it? When? For whom? What pattern was used? Is it patchwork or applique? And most importantly, why is it special to you now? After the picture is just right, then click the Browse button, find the picture on your computer. Then select it.